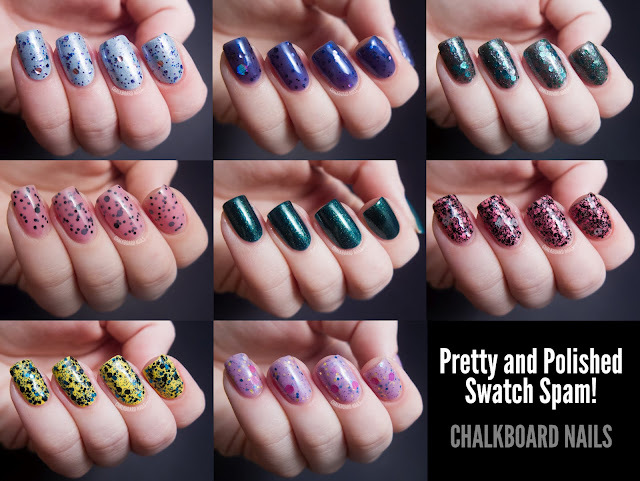 Today's post has swatches of some polishes by my favorite indie brands: Pretty & Polished! It's a long one, so let's get started! Tart is a super masterpiece. 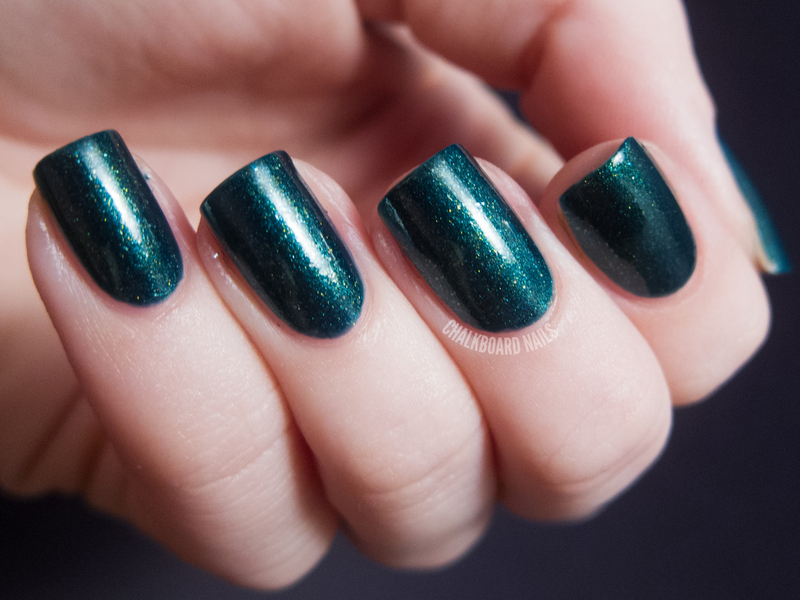 Honestly, this is one of my favorite indie polishes ever. 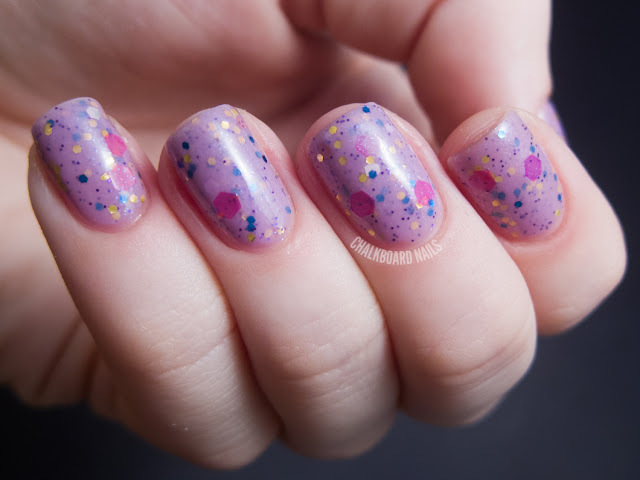 It's a pinky-purple base with shimmer, plus glitters in a multitude of shapes and sizes. The big pink hexes really make this one special, I think. This is two coats of Tart alone. Rat-a-tat is one of Chelsea's newer shades. 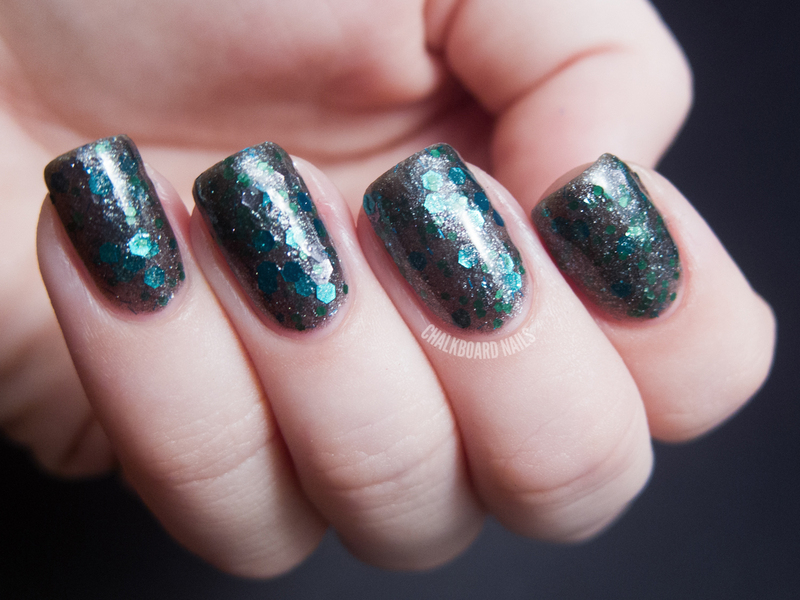 It's a dense glitter topcoat with black and teal glitters. There are even cool small teal bar glitters! For this swatch I've layered just one coat (so dense!) over China Glaze Happy Go Lucky. I seriously love this combo. Punk'd Up Betty means business. This is another dense glitter. I'm wearing three coats of it alone in this photo. Black glitter = my weakness, so you know I love it. It's also combined with matte pink glitters and large translucent hexes. Hemi-sphere is an older P&P shade that I don't think is being sold anymore, but I have the photo, so I figured I may as well post it too! It's a shimmery peacock green base with firefly flecks of gold. I took this photo a long time ago so I don't remember how many coats. I'd guess two? Elvis' Pink Cadillac is a pretty pink jelly base with two sizes of black glitter. Um, yeah. This one is awesome. This shade has actually been recently reformulated -- I've shown the new version. Cancer Moon was recently released as part of the P&P Zodiac Collection. This is three coats of it alone. I think next time I wear this I will layer it over something else. I have fairly curved nails, and the multitude of large hexes sat kind of flat on top of them. Anyway, it's a very unique polish! Born Again is another older polish from the Pretty and Polished line, but it's one of my favorites. It's a blurple jelly base with heavy gorgeous shimmer and various glitters. The best glitters in this are the large holographic hexes -- you can see one in action on my pinky in this photo. The final polish I have to share today is Amo Questa Canzone. My photo shows two coats over China Glaze Agent Lavender. You can see that the polish is made up of a shimmery base, and is accented with smaller glitters. The copper glitters have a bit of reflective curling but they sit flat enough on the nail that it's not an issue. So many awesome polishes, right? Which ones are your favorite? You can find Pretty and Polished on Etsy and on Facebook, and Chelsea also has a blog where she often debuts swatches of her new colors. Some of the products in this post were sent to me by the manufacturer for review. Tart and Amo Questa Canzone are my favorites, beautiful polishes! I love Rat-a-tat! 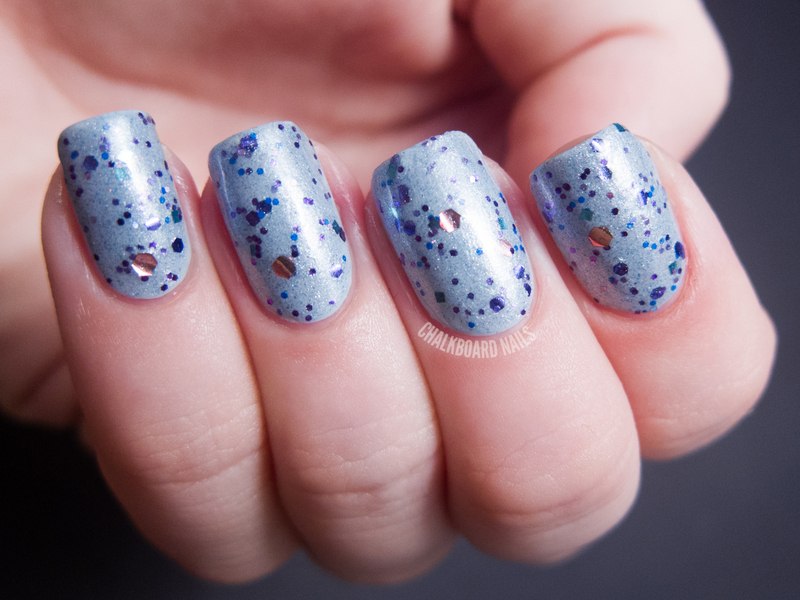 The mini teal bar glitters are so awesome! 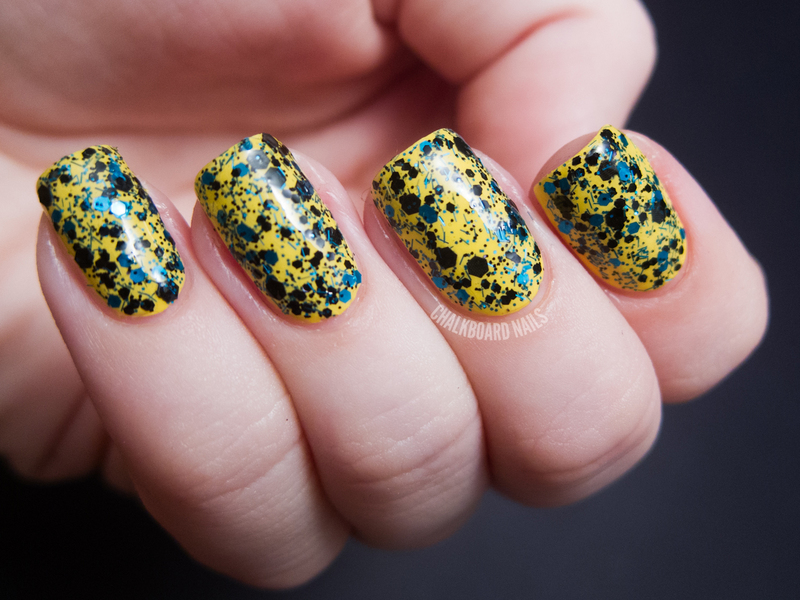 I'm in love with your combination of Rat-a-tat over the yellow China Glaze! It really pops out to me the most and it's just so cool looking. It's definitely my favorite, but I also love Tart, Punk'd Up Betty, and Elvis' Pink Cadillac. I LOVE Tart, it's one of my favorite polishes I own. I am so weak for pastel jellies filled with glitter. I also didn't think I needed Rat-a-Tat until I saw it over yellow, it looks SO cool that way. Tart and Punk'd Up Betty look awesome!! New Tart or old? I had a mini of the original formula- favorite polish ever. I finally bought a full-size bottle of the reformulated version and was disappointed with its differences from the original. The color wasn't as vibrant on my nail and the base seemed washed out. I believe I have the old version. The combo of rat-a-tat is really gorgeous! Wowza - punk'd up better is FABULOUS! I must get my hands on that! I have Tart and Party On My Yacht. Love them both, but I agree that Tart is probably my favorite indie polish. These are so adorable. I love how you did Rat-a-tat! Rat-a-tat is by far my favorite. It looks like some crazy form of nail art! Tart is a pretty color. ahhh PnP is one of my most favourite brands! I have soooo many that I love. Punk'd Up Betty is by far my fave newer one - when she said she was changing it, I assume with the translucent hexes? I believe mine are silver. Love these, my fave is the pink one! I love doing my nails, i really should start doing nail posts on my blog! Hemi-Sphere looks awesome! I wish she still made it so I could buy it! They're all pretty amazing but my favorite is Rat-a-tat. It's such an amazing combo! All look really, really awesome but I have to agree, Rat-a-tat over ChG Happy So Lucky is just stunning! OMG - Rat a Tat and Cancer Moon!! I love teal so I'm all over these!! I just picked up Elvis's Pink Cadillac in my last order; now I've got to try it out! This post also inspired some new lemmings, haha.